Apartment with two bedrooms, living room with kitchenette, bathroom. The apartment overlooks a courtyard decorated with ancient Roman columns, in a context of rare architectural beauty. Its location is unique as the building is nestled between the Colosseum, the Palatine, the Roman Forum and the Capitol. You can walk to the major sites of cultural and artistic interest of the city. The Vittoriano, a stone's throw from the apartment, offers interesting art exhibitions. The Capitol, one of the most beautiful squares of Rome, will give you a wonderful view of the Roman Forum and Palatine while the descent on Imperial Forums will lead you to the Forum of Augustus and the Colosseum. 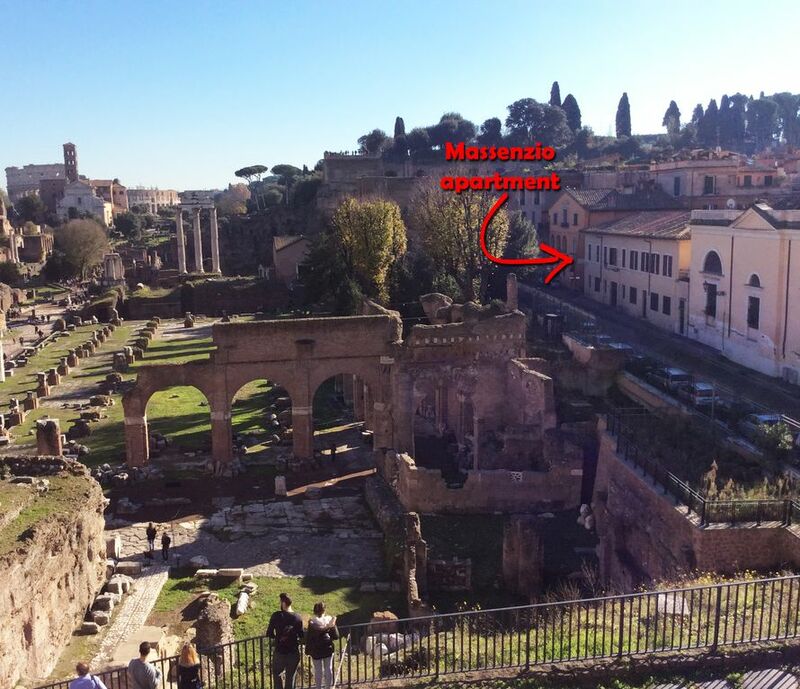 The apartment is located in a street overlooking the Fori, in an enchanting and absolutely incomparable position to fully enjoy the beauty of ancient Rome. It is located a stone's throw from the Colosseum, the Campidoglio, the Palatine Hill and in general from the most interesting historical and cultural sites of the city that can be comfortably reached on foot. I suggest an enchanting walk through Via del Campidoglio, passing the Lupa Capitolina, symbol of ancient Rome, via di San Pietro in Carcere to reach via dei Fori Imperiali which leads to the Colosseum. But do not miss to go on the Aventine, in the garden of the Oranges you can enjoy a splendid view over the city as well as marvel at the beauty of the churches of Sant 'Anselmo and the Basilica of the SS Bonifacio and Alessio. Personally I stop often in the garden of Sant'Anselmo to have a coffee immersed in the quiet and spirituality of the place. If you love good food and quality wine, do not miss, Saturday or Sunday, to jump in the market at zero km about 200 meters from the apartment. For the other days take a trip from the food store to the square of Fienili, you will find great food and hospitality.